At some of the parties that go on, the parents are home and actually serving the kids. Are you kidding me??? They are living through their kids and want them to be popular. Well, you idiots, when you loose your house and are living in a trailer park, remember what a GREAT time your kid had! We, as parents, are not stupid. We know our kids are gonna drink and experiment with drugs. You just hope they don't cross the line. I mean we ALL did it at some point in high school. But the difference is, we hid it! We didn't walk around with the red solo cup filled with beer or attend parties that our friends parents were at. Do what we did - hide in the woods, raid your parents liquor cabinet and put visine in your eyes BEFORE you get home. And whatever you do - DO NOT LOOK AT YOUR MOTHER IN THE EYE. LOL. What is wrong with these kids. They are smarter in some ways, but sooo stupid in other ways. 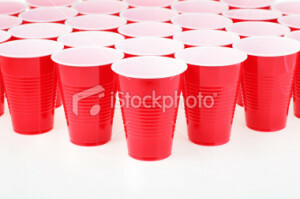 So, if you are at a party with your kid and he or she is carrying around a red solo cup, GRAB it and take a sip. For God's sake, they even made a song about it.